Home » How do I add music and videos to my iPod or iPhone? If you are looking for a way to add music to iPhone, then you’ve come to the right place. CopyTrans Manager is the lightweight iTunes alternative that helps you download music to iPhone by simply transferring tracks from computer to device. There’s no need for an iTunes sync and already-existing iPhone tracks remain untouched on your device. Install the program. If you need help installing CopyTrans Manager, please refer to the Installation guide. Run the program, connect the iPhone or iPad to your PС. 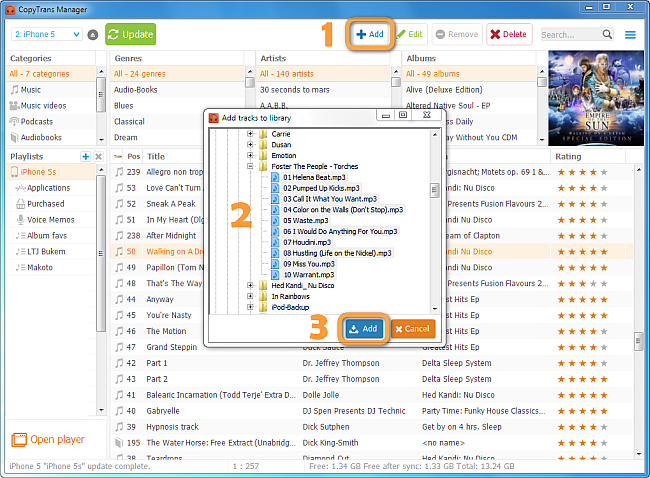 Then simply drag and drop your tracks from the Windows explorer into the CopyTrans Manager. Click the “Update” button to save the changes. That’s it! Click on the “+ Add” button. Select the tracks you wish to put on your iPhone and click on “Add”. In order to sync music to iPhone, hit on the “Update” button. This will apply the changes made and download music to your iPhone or iPod. For the other way round, in order to back up iPhone music and videos to PC, use CopyTrans Manager’s sister program called CopyTrans. CopyTrans Manager will only accept iPod/iPhone-compatible MP4 files. 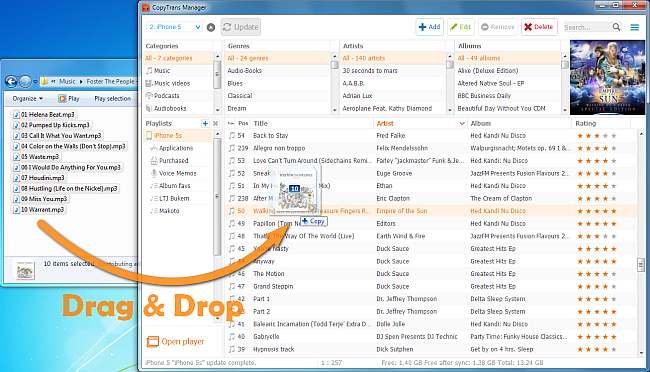 You can find out more about what file types are supported by your iPod/iPhone visit iPod wiki. If you want to know how to add a video file in another format such as MOV, read our article: How to watch movies on iPad. If you need to convert your videos to MP4, we suggest using the following free utility: Handbrake video transcoder. Please note that we do not support this utility in any way. If you need help with Handbrake, please visit their dedicated FAQ Section.